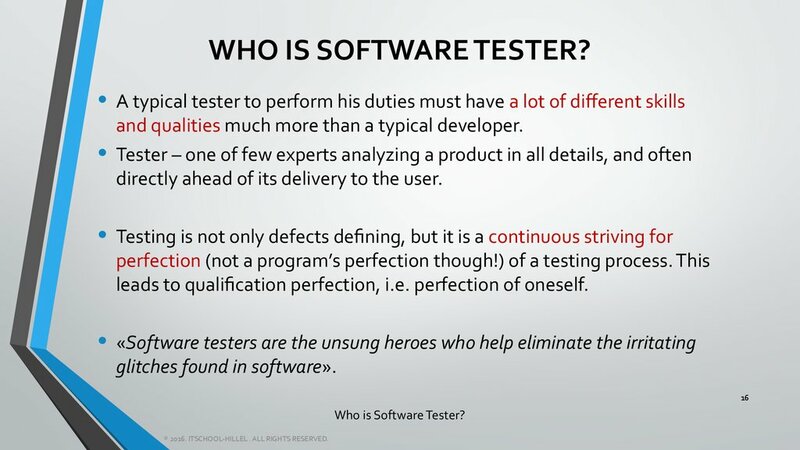 3. Who is Software Tester? ® 2016. ITSCHOOL-HILLEL . ALL RIGHTS RESERVED. 3. 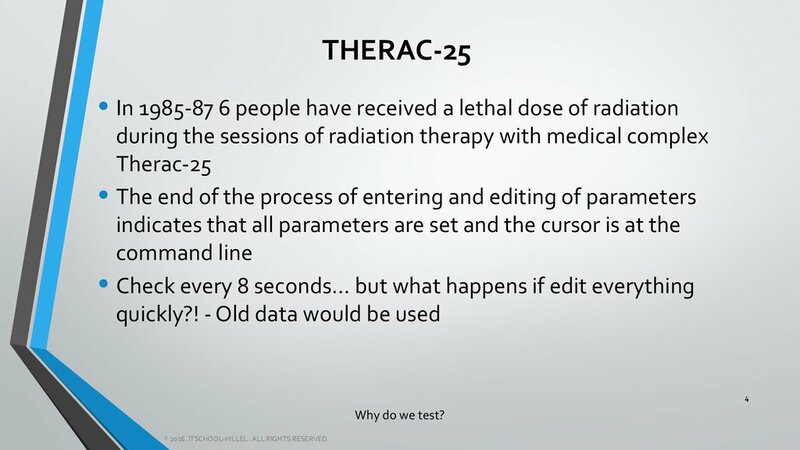 Why do we test? 4. 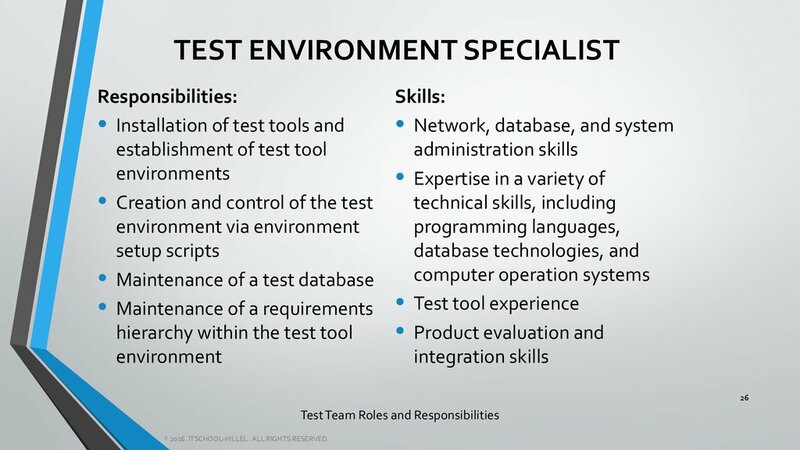 Why do we test? 5. 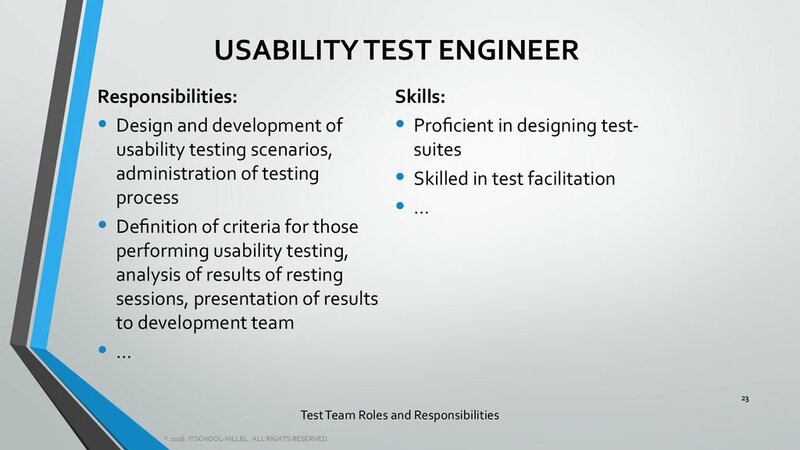 Why do we test? 6. 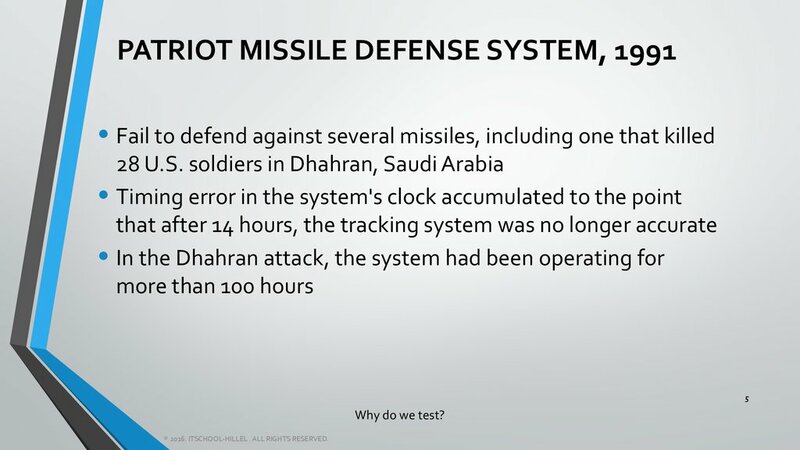 Why do we test? systems that the general public had. 7. 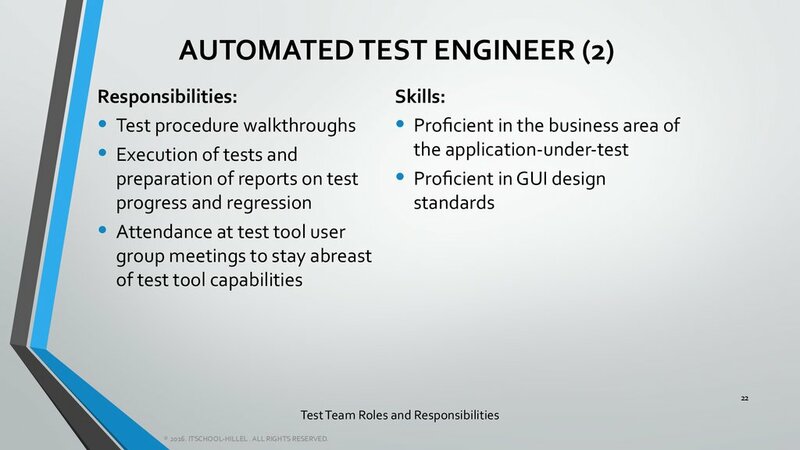 Why do we test? 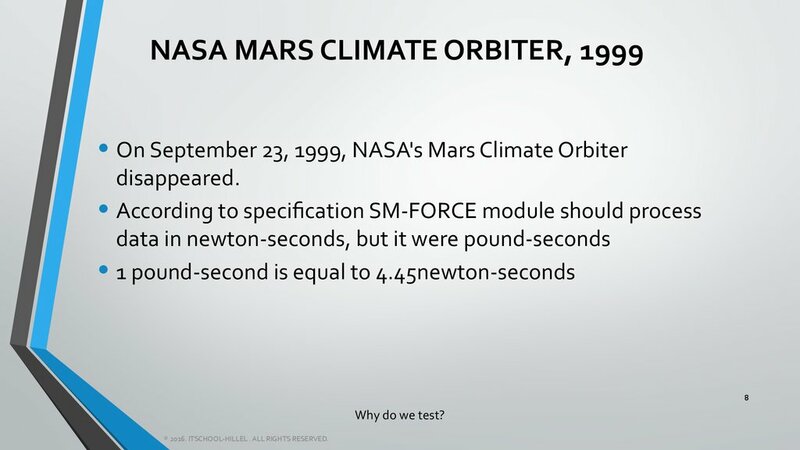 • (4195835 / 3145727) * 3145727 – 4195835 = ??? severity through press releases and public statements. user could prove that he was affected by the bug. 8. 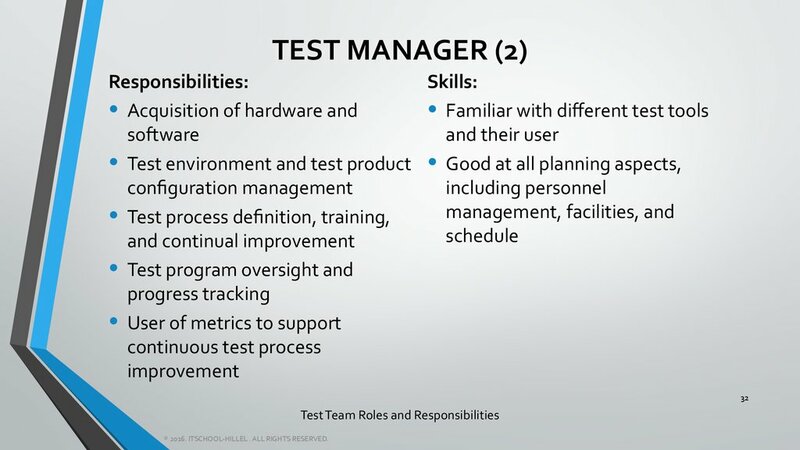 Why do we test? 9. 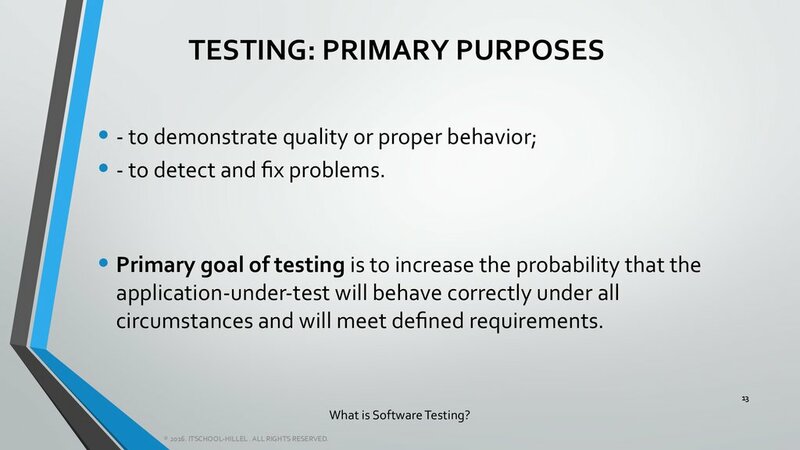 Why do we test? seconds after its lift-off from Kourou, French Guiana. cargo were valued at $500 million. 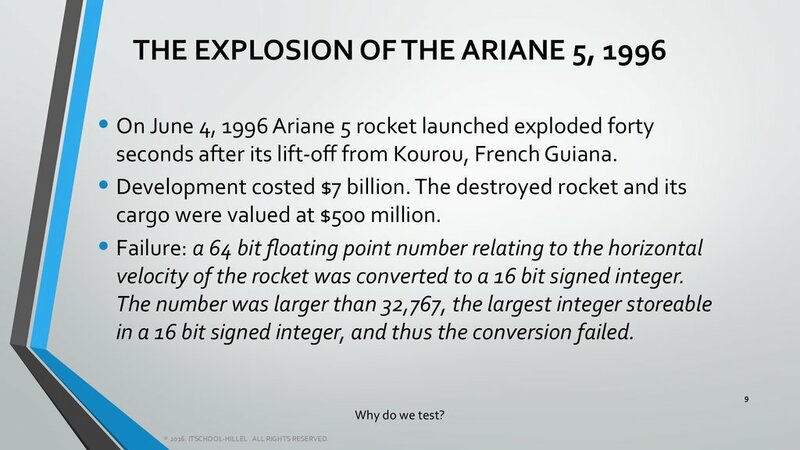 velocity of the rocket was converted to a 16 bit signed integer. in a 16 bit signed integer, and thus the conversion failed. 10. 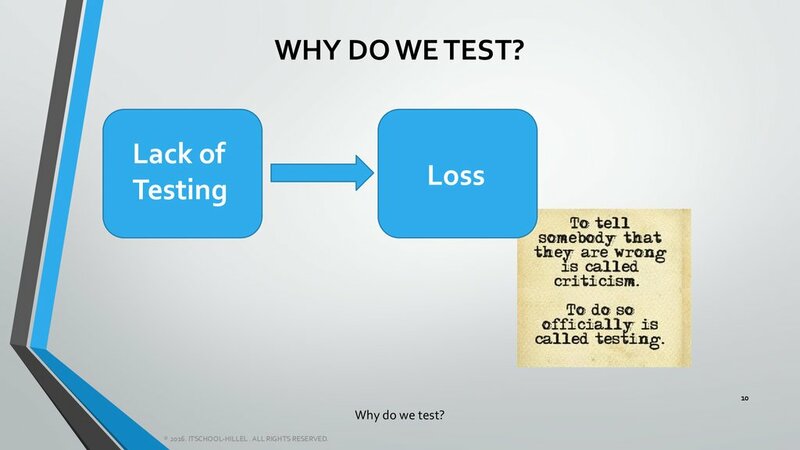 Why do we test? 11. 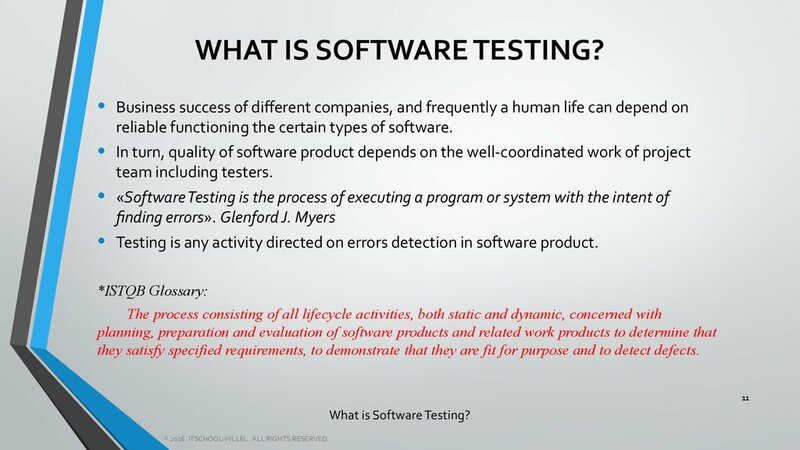 What is Software Testing? 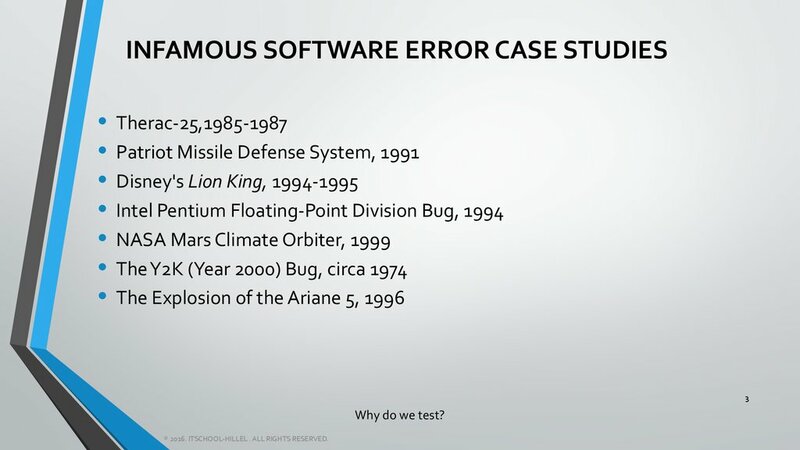 reliable functioning the certain types of software. 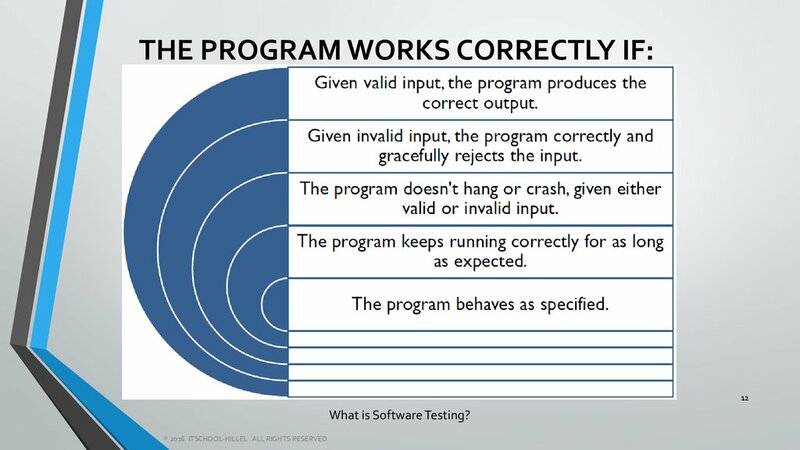 Testing is any activity directed on errors detection in software product. they satisfy specified requirements, to demonstrate that they are fit for purpose and to detect defects. 12. 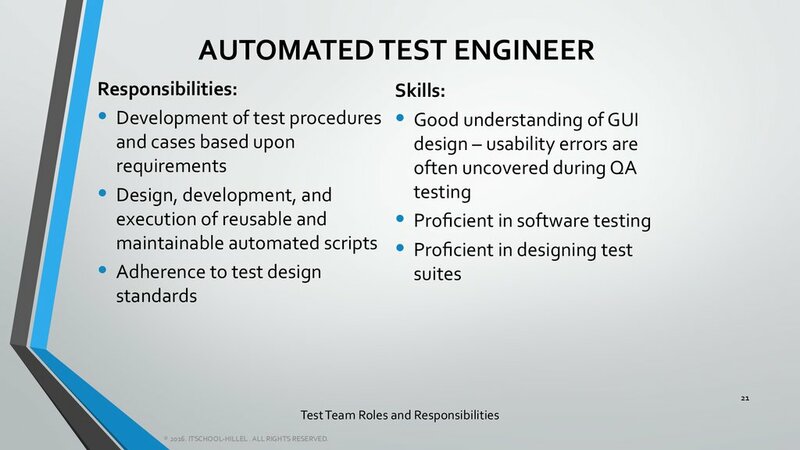 What is Software Testing? 13. 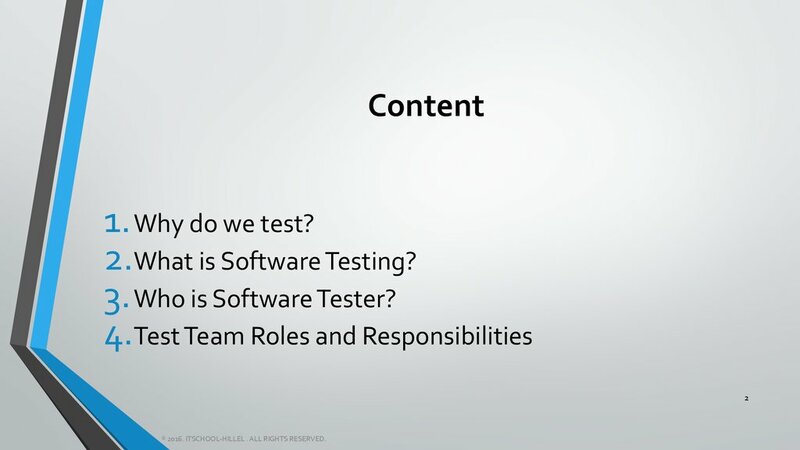 What is Software Testing? 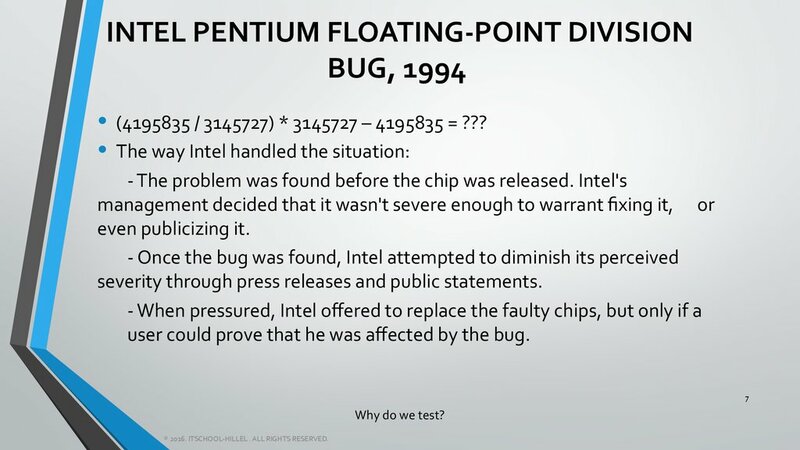 • - to detect and fix problems. circumstances and will meet defined requirements. 14. 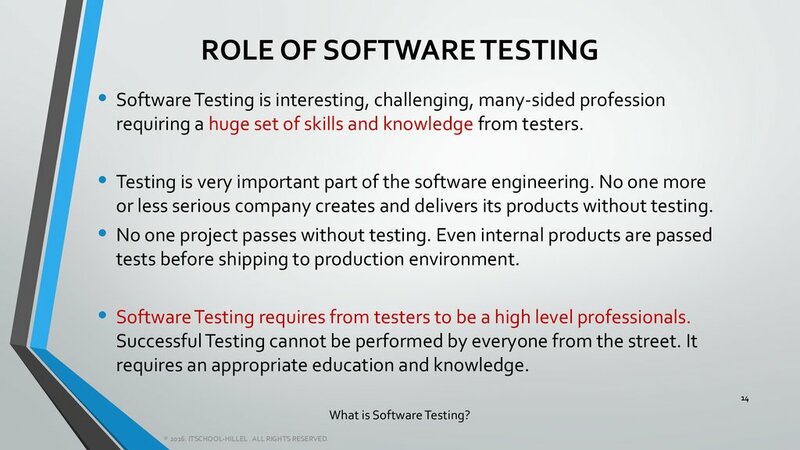 What is Software Testing? 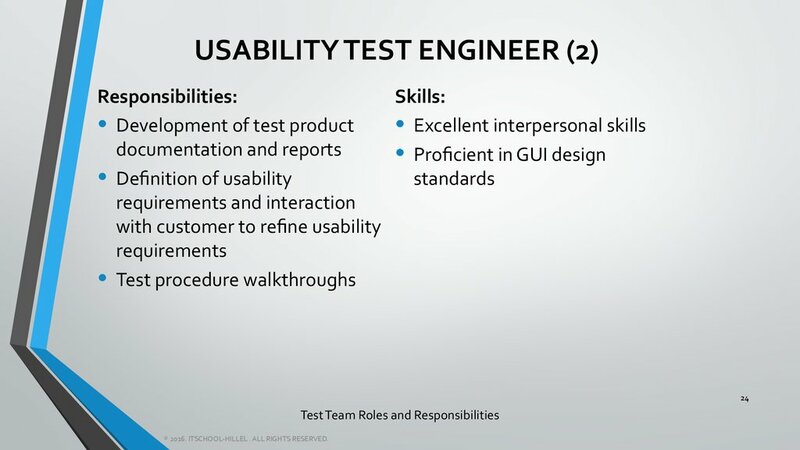 requiring a huge set of skills and knowledge from testers. 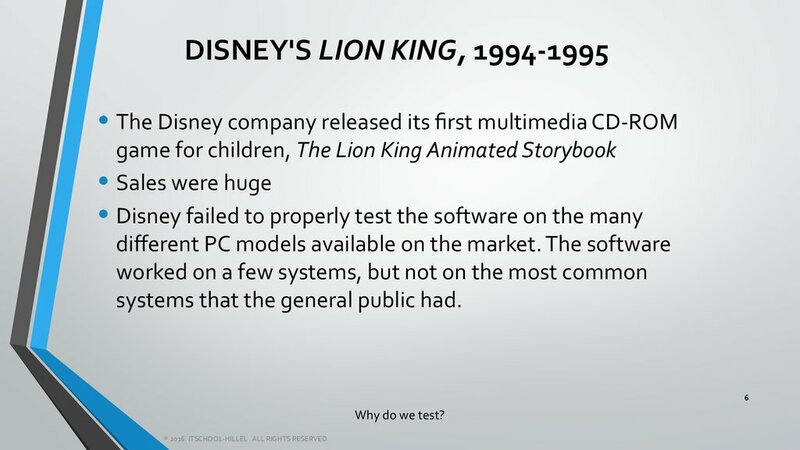 or less serious company creates and delivers its products without testing. tests before shipping to production environment. 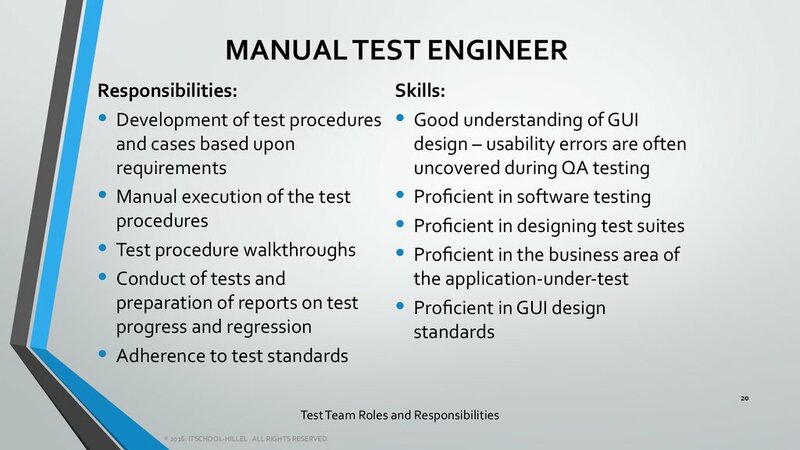 • Software Testing requires from testers to be a high level professionals. requires an appropriate education and knowledge. 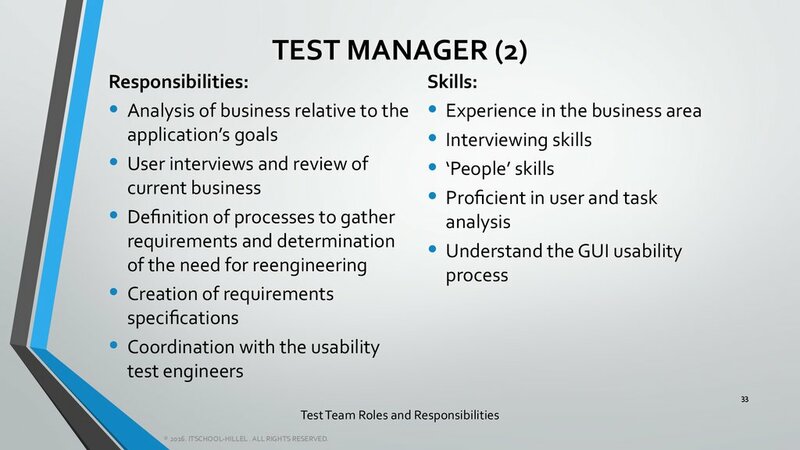 15. Who is Software Tester? use the software the same way that the «average» user would. 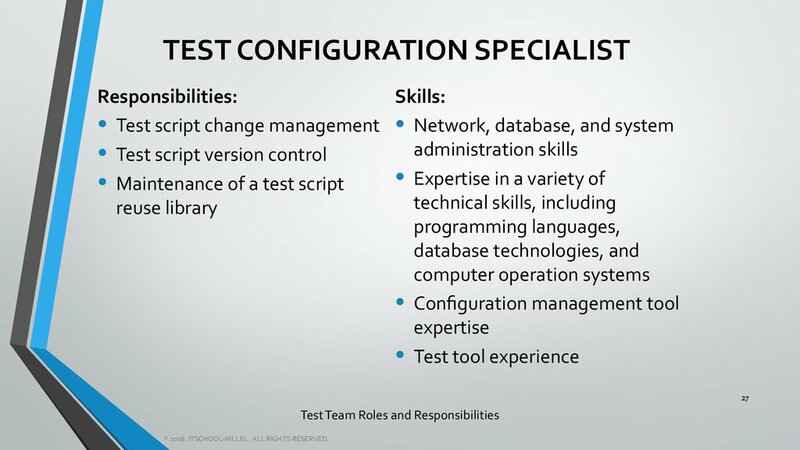 • Sometimes, testers should be experts, professionals in some IT-area. 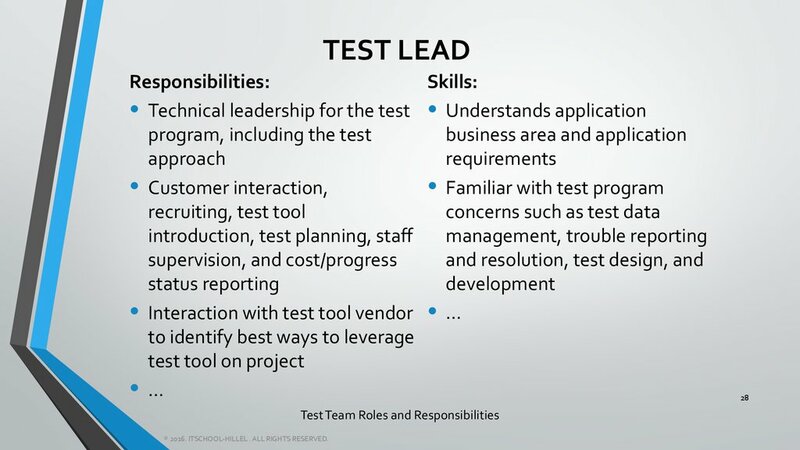 in the project can make informed decisions about product development. 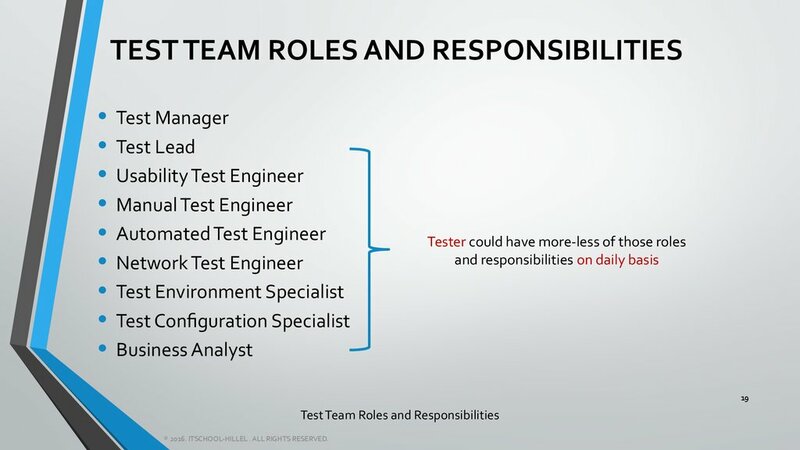 It is important to recognize that testers are not out to «break the code». 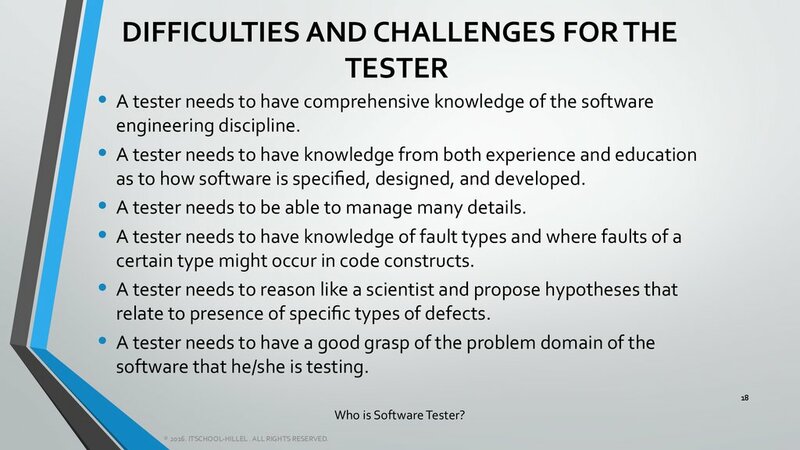 16. Who is Software Tester? 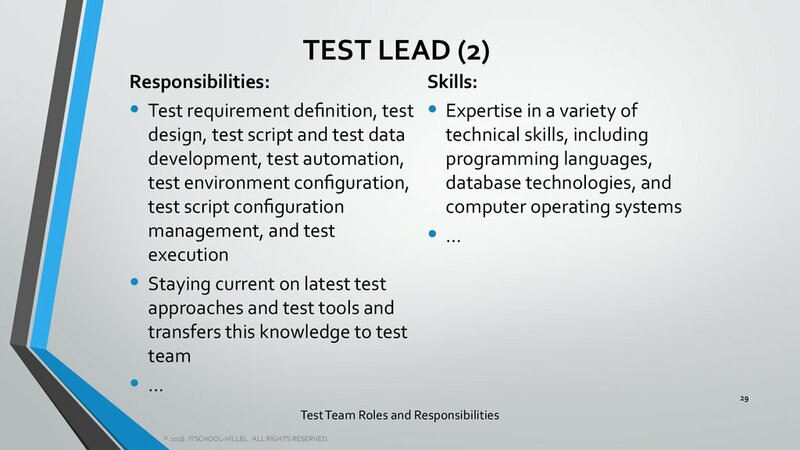 and qualities much more than a typical developer. directly ahead of its delivery to the user. 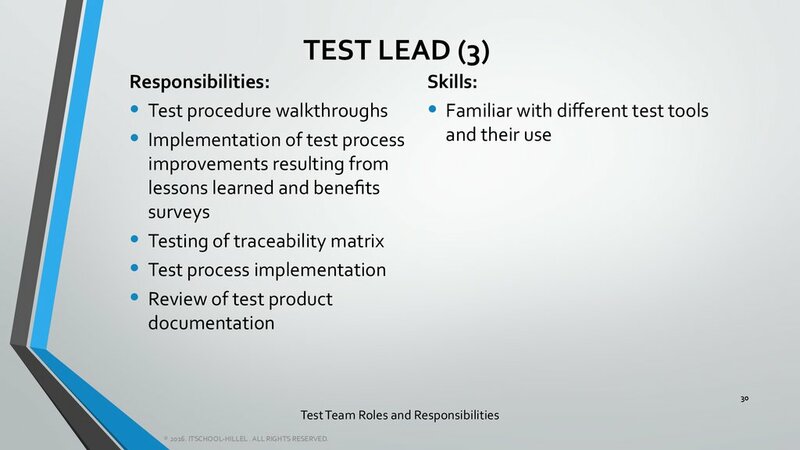 leads to qualification perfection, i.e. perfection of oneself. 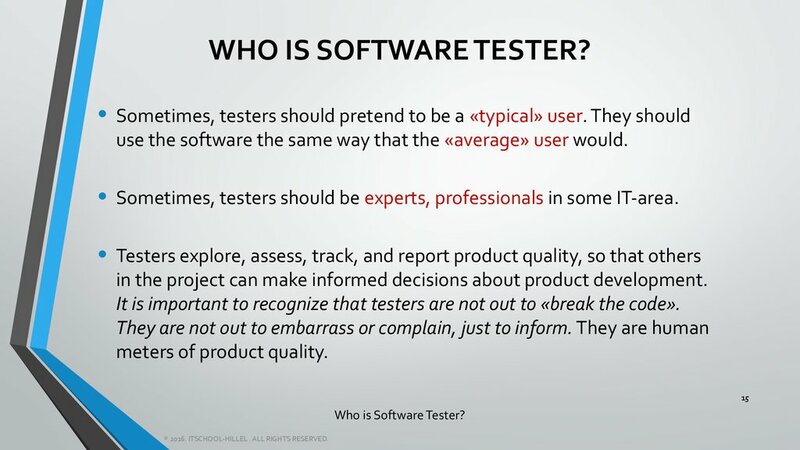 17. Who is Software Tester? 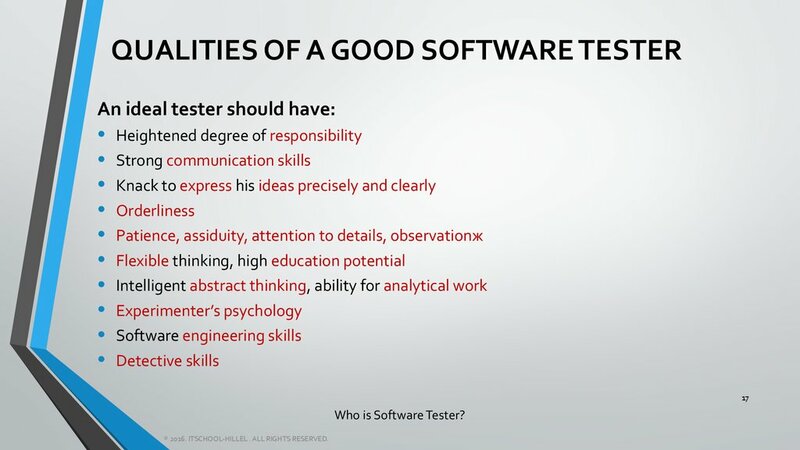 18. Who is Software Tester? 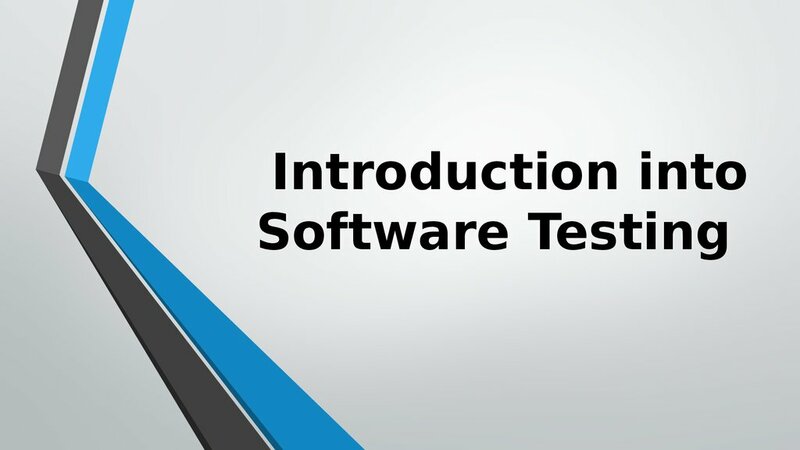 as to how software is specified, designed, and developed. 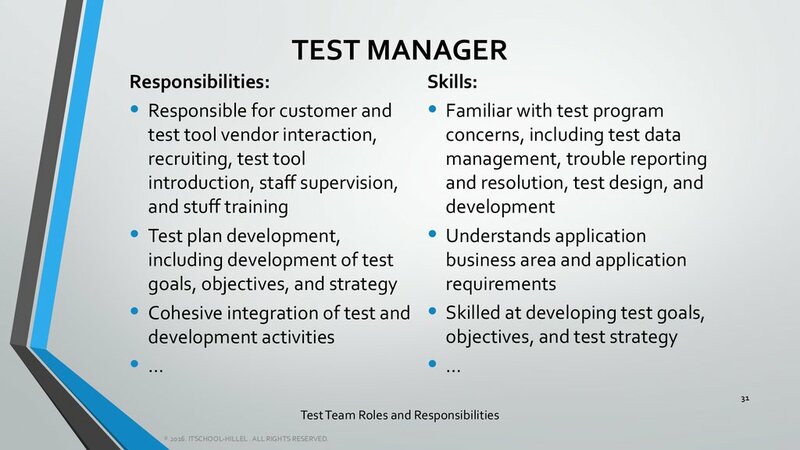 A tester needs to be able to manage many details. certain type might occur in code constructs. relate to presence of specific types of defects. 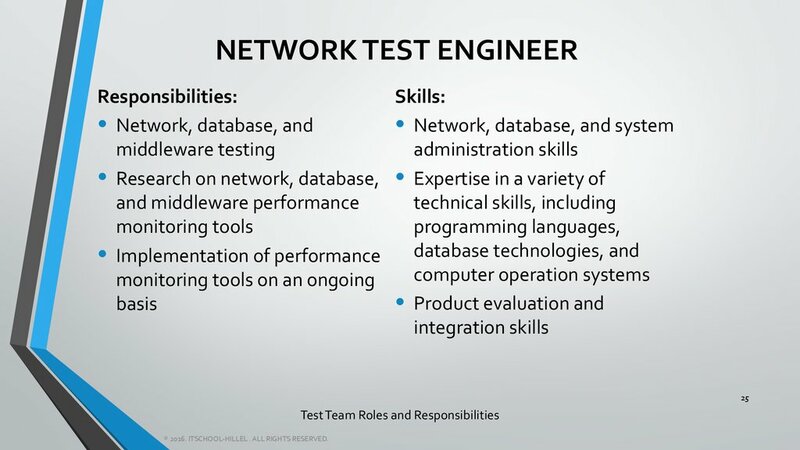 software that he/she is testing.